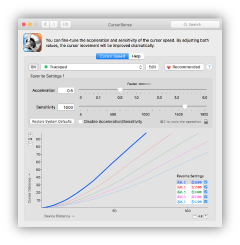 CursorSense is an application that adjusts cursor acceleration and sensitivity. It can move the cursor to a specified destination, such as OK and Cancel button automatically. 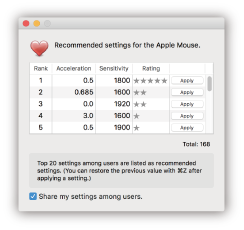 It is possible to adjust cursor movement via the tracking speed in the mouse and trackpad pane in System Preferences, but many users struggle to find an ideal setting with it and feel unsatisfied. 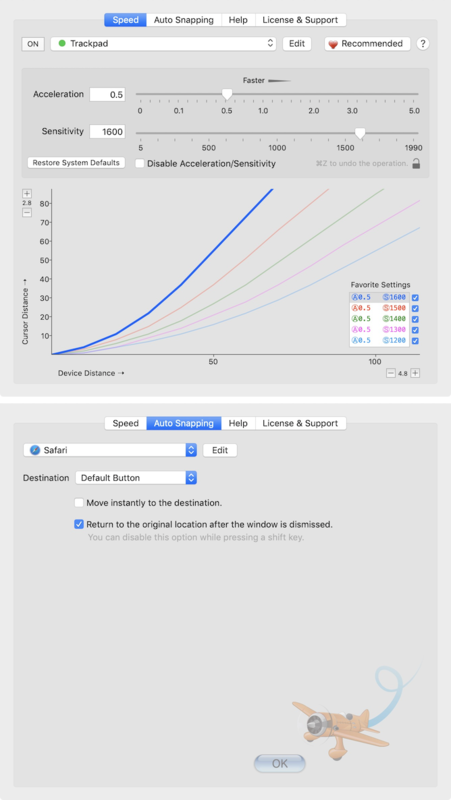 Cursor movement is derived from both tracking speed and sensitivity based on the distance the mouse moves, but System Preferences does not allow adjustment for sensitivity. Sensitivity represents the distance the cursor moves when the mouse is moved 1 inch. The OS always uses a default value. Tracking Speed represents acceleration. 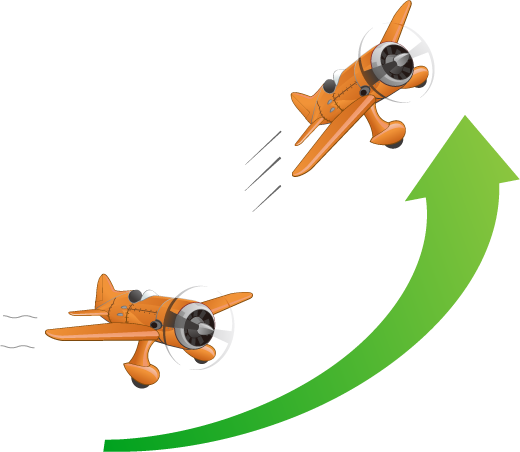 Bigger values increase the cursor movement when the mouse is moved quickly. Without adjustment of sensitivity, higher values for tracking speed will result in extreme cursor movement. Reducing tracking speed will avert this, but this will make it difficult to move the cursor a long distance. This is why many users fail to find an ideal setting. CursorSense is the only application that adjusts the sensitivity and tracking speed(*) of mice / trackpads. By adjusting both values, you can move the cursor just like you move your hand. (*) referred to as acceleration in CursorSense. Setting acceleration to 0 will make the cursor movement flat. This is good for drawing, but the cursor will move extremely slow. You will need to increase the sensitivity. 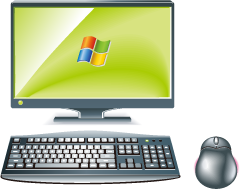 Many users who have a long experience in using Windows cannot get used to the cursor movement on the Mac. One reason might be that Windows uses sensitivity to adjust the cursor movement, and the Mac uses acceleration. 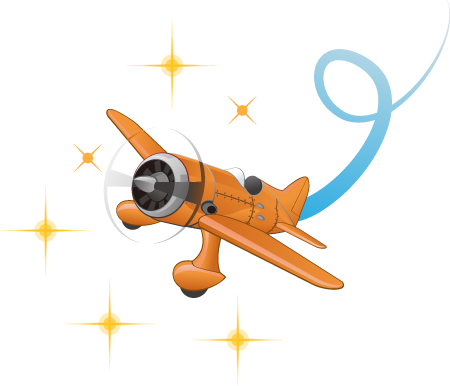 Set acceleration to 0.01 and use sensitivity to adjust the cursor movement to approximate the cursor movement in Windows. Gaming mice have a high DPI/CPI and precise cursor control. Some gaming mice move the cursor extremely fast even with acceleration set to 0. You will get the ideal cursor movement by decreasing sensitivity in this case. The Recommended Settings button shows a ranking of settings among users. You can find the ideal cursor movement easily by referring to popular settings. 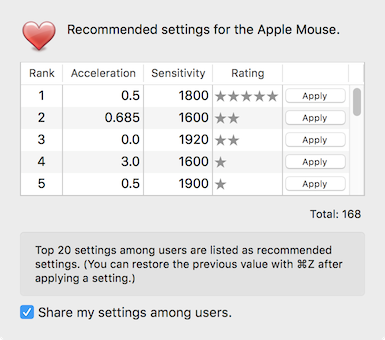 You can set acceleration and sensitivity for each mouse / trackpad individually. No need to change the settings every time when replacing the mouse as you would have to in System Preferences. CursorSense automatically moves the cursor to a specified destination, such as OK and Cancel button. It has an option for returning to the original location after the window is dismissed. You can set a destination for each application individually. There are many applications out there for changing the cursor movement but none of these are able to change the sensitivity, or has per-device settings. 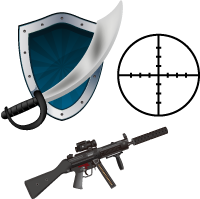 CursorSense is the only application with both features. A licence fee is US$9.99. You can try CursorSense without any limitations for 20 days.